If you are looking for a convenient way to find Christian single women or men, then ChristianLifestyle.com may be just what you have been looking for. It really takes just a few minutes to sign up and to begin searching for that special one. The platform is extremely simple to use and with members in more than 100 countries, there are plenty of opportunities to meet someone. This is a dating site which is tailored to finding a Christian partner, without the need to deliberate too much on your faith and beliefs. And with some extremely good value multi-month packages available, ChristianLifestyle is a very impressive all-round production. There is plenty to keep you engaged. When you want to contact other users, there are numerous options including private message, instant messaging and forums which provide more of a group environment to get to know someone. If you are feeling especially bold, you can also send a “flirt” to a potential match. One of the most useful features is the “invisible” mode which allows you to appear offline if you don’t want to be bothered by other users. In fact, it’s a wonder that it’s rare to find this little nugget elsewhere. In addition, the Rapid Match is also an innovative tool. The system will send you 10 potential matches daily. 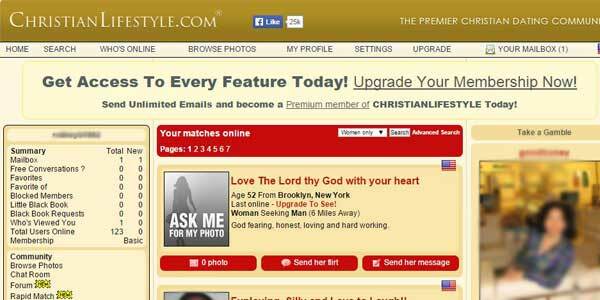 You are simply required to click “Yes” or No” and the ChristianLifestyle dating site will refine its search for you. Some sites require a lengthy sign-up process which requires a great deal of thought and concentration. However, the sign-up at Christian Lifestyle is much more in the style of BigChurch for example. The only difference is that it’s even quicker, taking no longer than a few minutes. All you need do is to enter a username and password, valid e-mail address and your date of birth. The only other requirement is to add a snappy headline to your profile to attract users and then a brief description to summarize who you are and what you’re looking for. You will then have access to the site. Conveniently, you can also sign up via your Facebook account! Very simply, there are two packages at ChristianLifestyle. There is a free option, which includes the ability to create your own profile, including a photo, search for matches and receive instant messages. However, if you want to be more pro-active and do anything beyond that, you will need to pay. If you want to test out the system, it is worth considering the 3-day trial for $7.95. A 1-month subscription costs $29.95 and the 3-month package is especially good value at $39.99. There is absolutely nothing complicated about ChristianLifestyle.com. Even if it is the first dating site you have ever used, it should be extremely straightforward. The dashboard is well organized with all the useful information clearly laid out. Your account provides a convenient overview of activity, including a favorites list, who is online and which users have viewed your profile. There should be no difficulty in finding out how to send a message, flirt, etc. Thanks to a mobile version of the site, you will also find that you can search and contact users wherever you are. Essentially, there are two different types of search that you can conduct. A Quick Search means that you can try to find a match using broad, basic categories such as age and location. This will give you a general idea of the pool of users out there. However, if you are looking to be more specific, especially when it comes to your Christian identity, then try an Advanced Search. There are just so many more criteria you can choose from, including hobbies, career and important details such as children and previous marriage. The variables also include denomination, how often you attend church and your life goals. Meanwhile, the Rapid Match provides an alternative, automated method with which to find a potential partner. Thanks to the search variables, there is ample opportunity to find the type of Christian partner you are looking for. With the ability to specify your denomination and church attendance, you should find a match with a like-minded individual. There is also scope to convey your Christian identity in your brief profile introduction, while forums provide a chance to get to know other Christian singles. However, unlike some sites such as ChristianCafe​, you won’t find prayer walls or requests to identify your favorite Scripture. In other words, if your Christianity is important to you, but not an ongoing theological debate, then Christian Lifestyle might be exactly the right option. ChristianLifestyle is a very solid dating site. You can dive straight in with minimum fuss and search for a like-minded Christian single. If you are looking to get deep and meaningful, there may be better options for you out there. However, if you are looking for a reliable, cost-effective platform to find a Christian partner, with some enticing features, this is a winner.